The present study was conducted at Defence Institute of Bio Energy Research (DIBER) Haldwani. Fully grown potted-plants of ten ornamental species viz., Scindapsus aures (Golden pothos), Ficus benjamiana (Weeping fig), Hedera helix (English ivy), Quercue leucotrichopora (Banjh oak), Aglaonema crispum (Chinese evergreen), Dracaena marginata (Rededged dracaena), Codiaeum verigatum (croton), Chlorophytum comosum (Spider plant), Sansevieria trifasciata (Snake plant), Chrysalidocarpus lutescens (Areca palm) were used in the present study. To estimate the Air pollution tolerance index (APTI), various biochemical parameters such as plant leaf pH, relative water content, total chlorophyll content and ascorbic acid content were estimated. APTI values ranged from 7.37 (Aglaonema crispum) to 9.45 (Ficus benjamina). Ficus benjamina appeared as the most tolerant species among the tested indoor plants followed by Scindapsus aures, which must be included in indoor landscape as good air purifiers along with Aglaonema crispum as bioindicators to sense the pollution in indoor environment. Most of the urban areas of the world today have high concentration of air pollutants emanating from different sources like motor vehicles, power plants, industrials setups, residential heating and even indoor appliances and materials . These urban air pollutants not only pose a threat to the urban environment but also a matter of concern for human health. Among the air pollutants, air borne particulates including trace elements and volatile gases are serious concern and required to be monitored and regulated through every possible means . Today our life style and working environment is also forcing us to be in indoor environment for long number of hours leading to exposure of various indoor pollutants which are being released by various office appliances and décor . It is well documented that plants play an important role in monitoring the ecological balance by collecting heavy metals such as mercury and lead from the air including formaldehyde, nitrogen and sulfur oxide vis-a-vis provide psychological push through mood lifting and enhanced alertness [4-8] . Plants differs markedly in their responses to pollutants some being sensitive and others hardy and tolerant. The sensitivity and tolerance to the pollution in plants depend on the various biochemical parameters like ascorbic acid content total chlorophyll, relative water content and leaf extract pH . The response of plants towards air can be assessed by Air pollutant tolerance index (APTI) which is being used by landscapers in selecting plant species for a particular area in order of their pollution tolerance. The sensitive species can be used as bio-indicators of pollution . Though there have been several studies on scoring tree species for their APTI values but studies on indoor plants are negligible [11-14]. Considering these facts, some indoor plants were selected to test their APTI scoring to select indoor air bio-indicators to be placed in offices and remotely located soldiers huts to reduce the indoor pollution and improving the breathing air quality to some extent where keroheaters and bhukaris are used to heat up the ambience. The experiments were conducted at Defence Institute of Bio Energy Research (DIBER) Haldwani. Fully grown pottedplants of ten ornamental species viz., Scindapsus aures (Golden pothos), Ficus benjamiana (Weeping fig), Hedera helix (English ivy), Quercue leucotrichopora (Banjh oak), Aglaonema crispum (Chinese evergreen), Dracaena marginata (Rededged dracaena), Codiaeum verigatum (croton), Chlorophytum comosum (Spider plant), Sansevieria trifasciata (Snake plant), Chrysalidocarpus lutescens (Areca palm) were used in the present study. To estimate the Air pollution tolerance index (APTI), various biochemical parameters such as plant leaf pH relative water content total chlorophyll content and ascorbic acid content were estimated [10,15,16]. Biochemical parameters were estimated using fully expanded healthy leaves of the second and third node from the top of the shoot of all selected plants. Samples were collected from the three random plants. Three samples were collected from each plant and average was worked out. Where A = ascorbic acid (mg/ g), T = total chlorophyll (mg/g), P = pH of leaf extract, R = relative water content of leaf extract. Continuous exposure of plants to the environment forces them to absorb, accumulate and integrated pollutants impinging on their foliar surfaces. Consequently they show visible or suitable changes depending on their sensitivity level. In the present study, biochemical parameters like ascorbic acid, relative water content, total chlorophyll content, and leaf extract pH were used in the evaluating their degree of tolerance to air pollution. The maximum amount of ascorbic acid was found in Quercue leucotrcophora (3.12 μg/g fw) and the minimum was in Sansevieria trifasciata (0.86 μg/g fw) (Figure 1). Figure 1: Ascorbic acid content (μg/g fw). Ascorbic acid has been reported to play an important role in cell wall synthesis, photosynthetic carbon fixation, and cell division vis-à-vis resistance of adverse environmental conditions including air pollution (Figure 2). 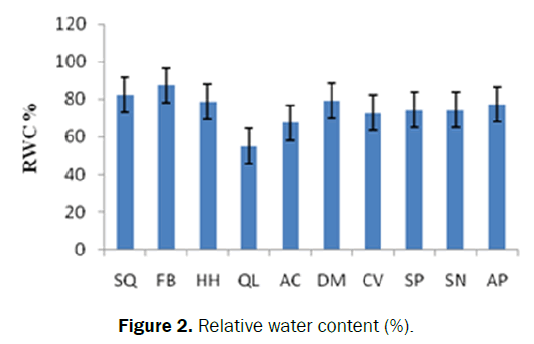 On the other hand, Relative Water Content (RWC) helps the plant to maintain its physiological balance under stress conditions when the transpiration rates are usually higher . RWC in the plant is associated with protoplasmic permeability in cells which causes loss of water and dissolved nutrients, resulting in early senescence of leaves . RWC was found minimum in Quercue leucotrcophora (55.21) and the maximum in Ficus benjamina (87.41). Figure 2: Relative water content (%). Plants generally accumulate some kind of compatible solute such as proline or polyols in cystol to raise osmotic pressure and thereby maintain both turgor and driving gradient for water uptake and protect membrane and proteins. RWC has also been closely related with proline accumulation and thereby stress tolerance in plants. 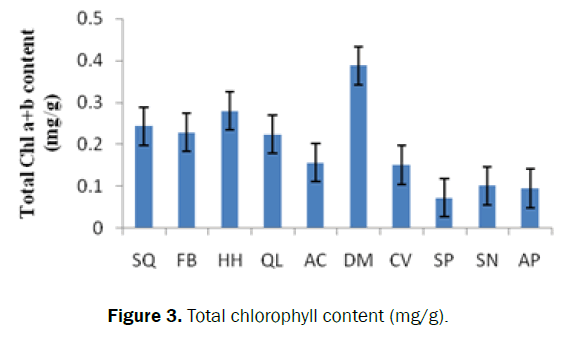 Total chlorophyll content varied from 0.072- 0.388 mg/g (Figure 3). Figure 3: Total chlorophyll content (mg/g). Air pollutants get their entry in to plant system through stomata and cause partial denaturation of chloroplast and decrease pigment content due to replacement of Mg ions with hydrogen atoms [10,19]. Chlorophyll degradation leads to lower carbon dioxide fixation. Higher chlorophylly content might favour the plants to tolerate pollution better . 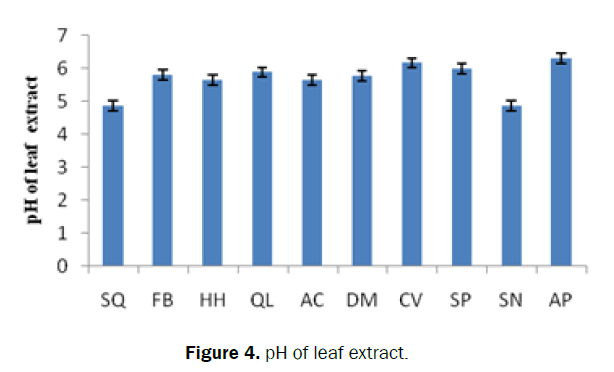 pH of leaf extract was in the range of 4.86 – 6.31 (Figure 4). Figure 4: pH of leaf extract. The lowest value was observed in Sindepsus aures and maximum value was observed in Chrysalidocarpus lutescens. Plant species with neutral to alkaline nature have been reported to have better pollution tolerance as alkalinity increases the hexosugar conversion efficiency to ascorbic acid and photosynthetic efficiency [21,22]. In the present study, APTI values ranged from 7.37 (Aglaonema crispum) to 9.45 (Ficus benjamina) (Table 1). Table 1. APTI values followed by the same letters are not significantly different as per Duncan’s Multiple Range Test, significance tested at P≤0.01. APTI values provide reliable estimates of plant susceptibility to air pollutants. The sensitive species can be used as bioindicators and tolerant species can be used as sink for air pollution mitigation. Plants having low APTI values are rated as sensitive. APTI values mostly in tree and shrubs have been reported which ranged from 3-5, 2014), 9.4 – 64.1 6.51- 25.77 6-12 6.42- 21.65 and 22.95- 87.82 [14,23,24]. Ficus benjamina appeared as the most tolerant species among the tested indoor plants followed by Scindapsus aures, which must be included in indoor landscape as good air purifiers along with Aglaonema crispum as bioindicators to sense the pollution in indoor environment . Although plant sensitivity to pollution is affected by climatic conditions and harsh climatic with low temperatures at high altitude pose challenges to human survival due to hypoxial condition but addition of these indoor plants over others can help in improving the indoor air quality. The authors acknowledge the grant provided by DRDO, Ministry of Defence, Govt of India and Director DIPAS, New Delhi for her constant guidance and encouragement during the study carried out under project. Help by Sh. Kamal Kumar, SRF during experimentation is also acknowledged. Lopez, JM, et al. Levels of selected metals in ambient air PM10 in an urban site of Zaragoza (Spain). Environ Res. 2005;99:58-67. Sandeep Kar, et al. Metallic components of traffic induced urban aerosol, their spatial variation and source apportionment. Environ Monitoring Assess. 2010;168:561-574. Majbrit Dela Cruz, et al. Can ornamental potted plants remove volatile organic compounds from indoor air? — a review. Environ Sci Pollut Res. 2014;1-20. Wolverton BC, et al. Interior landscape plants for indoor air pollution abatement. National Aeronautics and Space Administration Washington, DC; 1989. Smodis B, et al. Validation and application of plants as biomonitors of trace elements atmospheric pollution- A coordinated effort in 14 countries. J Atmos Chem. 2004;49:3-13. Raanaas RK, et al. Benefits of indoor plants on attention capacity in an office setting. J Environ Psychol. 2011;31:99-105. Shibata S, et al. Effects of an indoor plant on creative task performance and mood. Scandinavian J Psychol. 2004;45:373-381. Xu Z, et al. Formaldehyde removal by potted plant-soil system. J Hazard Mater. 2011;192:314-318. Dr. Th. Keeler, et al. Air pollution and ascorbic acid. Eur J Forestry Pathol. 1977;7:338-350. Singh SK, et al. Evaluation of plants for their tolerance to air pollution. In Proc Symp on Air pollution control, IIT, Delhi; 1983. Karthiyayini R, et al. Air pollution tolerance index of certain plants of Coimbatore-ooty highways, near ITI area, Coimbatore Tamilnadu. Pollution Res. 2005;24:801-803. Dwivedi AK, et al. Pollution tolerance and distribution pattern of plants in surrounding area of coal-fired industries. J Environ Biol. 2007;28:257-263. Abed Esfahani A, et al. Assessemnt of air pollution tolerance index of higher plants suitable for green belt development in East of Esfahan city, Iran. J Ornamental Hort Plants. 2013;3:87-94. Sharma M, et al. Analysis of biological factors for determination of air pollution tolerance index of selected plants in Yamuna nagar, India. J Env Biol. 2013;34:509-514. Xiao- yun Jia, et al. Molecular cloning and characterization of wheat calreticulin (CRT) gene involved in drought-stressed responses. J Exp Bot. 2008;59:739-751. Rami M, et al. Cholorophyll determination in intact tissue using N,N-Dimethylformide. Plant Physiol. 1980;65:478-479. Dedio W, et al. Water relations in wheat leaves as screening test for drought resistance. Can J Plant Sci. 1975;55:369-378. Masuch G, et al. Single and combined effect of continuous and discontinuous O3 and SO2 emmision Norway spruce needles historical and cytological changes. International J Environ Analyt Chem. 1988;32:213-241. Rao DN, et al. Effect of SO2 on lichen alga with special reference to chlorophyll. Bryologist. 1966;69:69-75. Joshi, et al. Air quality monitoring of Indore city with speciala reference to SO2 and tree barks pH. J Environ Biol. 1993;14:157-162. Yan-Ju L, et al. Variation in air pollution tolerance index of plants near a steel factory: implications for landscape-plant species selection for industrial areas. WSEAS Transactions on Environment and Development. 2008;4:24-32. Ninave SY, et al. Foliar biochemical features of plants as indicators of air pollution. Bull Environ Contam Toxicol. 2000;133-140. Suvarna L, et al. Air pollution tolerance index of various plant species growing in industrial areas. The Bioscan, 2008;2:203-206. Nwadinigwe AO, et al. Air pollution tolerance indices of some plants around Ama industrial complex in Enugu state, Nigeria. African J Biotech. 2014;13:1231-1236. Rao DN, et al. Sulphur dioxide pollution versus plant injury with special reference to fumigation anf percipitation. In: Proceeding of Symposium on Air Pollution control. Indian Association for air pollution control, New Delhi, India. 1983.